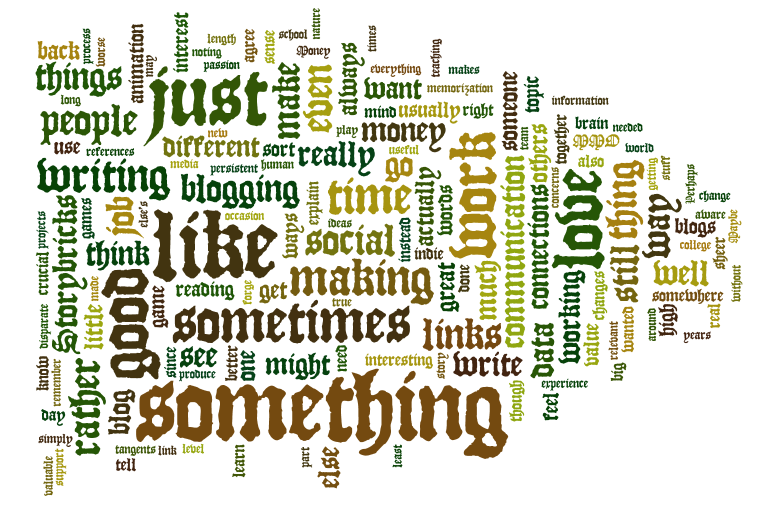 This one’s simple: Blogging is a social activity. It’s not “social” like a FaceBook “cow clicker” pseudo-game, or “social” like raiding in an MMO, more like a good dozen-plus-player version of Frozen Synapse, with sparks flying between ideas as people connect thoughts and forge new conceptual links. It’s asynchronous and persistent, both very useful for fostering communication. It’s even possible to forge friendships online. Now, noting that it’s possible you’re befriending a persona instead of a person, it’s still true that social interaction online is still social interaction. Those are people out there, not Turing-complete bloggerbots. (Though in twenty years or so that might no longer be true.) People with interests, feeling, histories, preferences, and sometimes even a sense of humor. Over the years I’ve met a bunch of pretty cool people, like Psychochild, Professor Beej, Larisa, The Friendly Necromancer, Gordon, Cynwise, Ixobelle, Klepsacovic, Gazimoff, Yeebo, MBP, Dblade, Saylah, Nugget, Dusty, Syl, Thallian and Anton, Tipa, Ferrel, Pete, Victor Stillwater, Anjin, Modran, ZombiePirate, Void, Rog, Stabs, the guys at KTR and Word of Shadow… others I’m forgetting at the moment, and others that have dropped off the grid, like Wiqd, Mike Darga, Phaelia and Andrew of Systemic Babble. Anyone I link to over on that Blogroll on the right is someone worth reading. I might not always agree with any given one of them, but then again, I don’t always agree with my local friends or family. Even when I don’t agree with them, there’s usually still something interesting there. Blog writing often follows blog reading, and the two tend to positively reinforce each other. Commenting on someone else’s blog is a great way to make the two work together even more. It’s about communication, really, and as some are wont to remind us, humans out here in “monkeyspace” are social animals, for better or worse. Thing is, with a blog, you can take it at your own pace rather than diving into a real time social gathering with real people around. The ability to filter and react at leisure isn’t exactly a magic potion to make wallflowers into butterflies, but it does go a long way toward opening conversational channels that might not otherwise exist. Blogging isn’t a FaceBook or Twitter pith contest, neither is it an Instant Messaging textspeak competition. It’s not a Ventrilo cacophony or monkeyspace mosh pit. It’s a more sedate matter, allowing for deeper thought and more civil dialogue. Practice, as always, varies as widely as fingerprints, but blogs really do offer a communication platform that isn’t quite of the same nature as some of the other big “social” media. They are valuable as a result, and a crucial ingredient to the social stew that is the modern internet. I’d even go so far as to call it a leavening ingredient, one that counters the leetspeak ADHD impetus of far too many “social” media outlets. There’s great value in the long form of written communication. There’s value in having outlets that aren’t controlled by big media conglomerates or corporations. It’s important to have places where impassioned writers can make cohesive arguments and keep public records without being shouted down by troll hordes or censored by The Man. You may not change the world in big ways with your blog, but blogging is changing the world. If nothing else, it’s a good thing to be aware of and understand the potential of the beast. …and sometimes, you don’t need to be a big force of change, you just need to be a good part of someone else’s life. Blogs can help forge links that might not otherwise exist between people, and sometimes, that makes all the difference.